The Cogent DataHub enables you to ‘tunnel’ data across a network, thanks to its secure, robust peer-to-peer connection model that completely avoids the DCOM and Windows security problems usually encountered when trying to network OPC DA data. 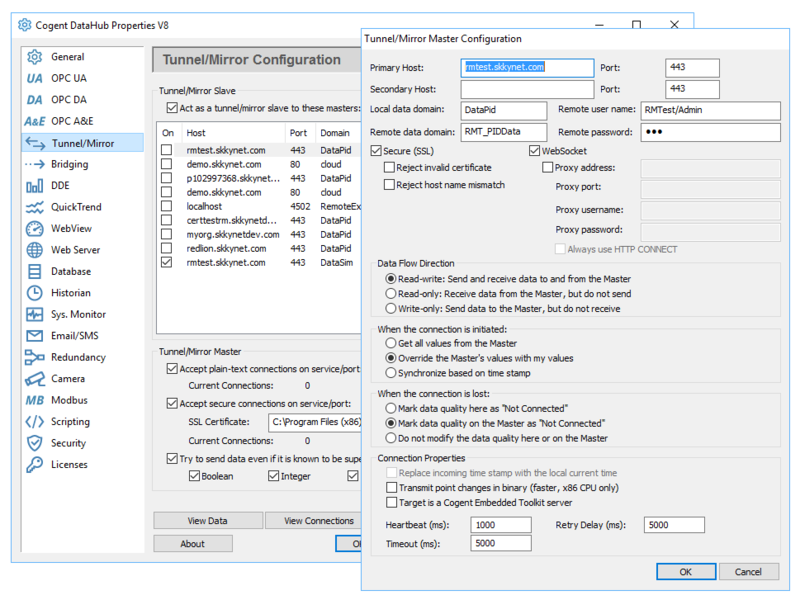 Why use the Cogent DataHub for tunnelling across a network? The Cogent DataHub keeps all OPC transactions local to the computer, thus fully protecting the client programs from any network irregularities. Other products expose OPC transactions to network irregularities, making client programs subject to timeouts, delays, and blocking behaviour. Link monitoring can reduce these effects, while the Cogent DataHub eliminates them. The Cogent DataHub mirrors data across the network, so that both sides maintain a complete set of all the data. This shields the clients from network breaks as it lets them continue to work with the last known values from the server. When the connection is re-established, both sides synchronize the data set. Other products pass data across the network on a point by point basis and maintain no knowledge of the current state of the points in the system. A network break leaves the client applications stuck with no data to work with. A single tunnel can be shared by multiple client applications. This significantly reduces network bandwidth and means the customer can reduce licensing costs as all clients (or servers) on the same computer share a single tunnel connection. Other tunnelling products require a separate network connection for each client-server connection. This increases the load on the system, the load on the network and increases licensing costs. A simple 3 step procedure gets you up and running in minutes. SSL networking provides a secure connection over a network or Internet connection, including optional password protection. The tunnelling connection works across firewall boundaries. The Cogent DataHub provides immediate response and automatic recovery from network interruptions and link detection timeouts can be as fast as 50 milliseconds. Licensing is quick and easy using software key codes. No hardware keys to worry about. The Cogent DataHub can connect between XP, 2003 Server, Vista, 2008 Server and Windows 7. Unique to the Cogent DataHub is the ability to tunnel data between programs on Windows and Linux operating systems. A powerful built-in scripting language lets you fully customize your OPC applications by attaching custom code to process events and point changes. Our embedded toolkit helps you build custom tunnelling connections for any non-Windows OS that supports TCP, such as Linux, QNX, Itron, VxWorks, etc. Full read and write support for Excel for accurate reporting and real-time Excel analysis of your plant data. The Cogent DataHub also has the ability to aggregate data from multiple OPC Servers into a common data set, giving you a single point of access to all of your plant data. Support for the latest web technologies lets you build powerful web applications for process visualization and control. Full read and write access to ODBC databases so you can log data to SQL/Access/Oracle, or integrate database information into your OPC applications. Read more about Network Tunnelling.